LAS VEGAS, Jan. 8, 2019 – At CES 2019, Mobileye, a leading pioneer in advanced driver assistance systems (ADAS) and autonomous driving (AD), announced it is exploring a strategic collaboration with Great Wall Motors (GWM), a leading domestic automaker in China. As part of the engagement, GWM will look to integrate Mobileye-based ADAS systems ranging from L0-L2+ onto a wide range of vehicle models over the next three to five years. In parallel with ADAS integration, the companies will explore development of higher autonomous systems (L3 and above) to address the unique characteristics of China’s roadways. The potential partnership with GWM may extend Mobileye’s growing presence in China and builds on continued momentum for the company’s ADAS technology. As demand for ADAS solutions grows among automakers and becomes increasingly standard around the world, Mobileye is leveraging the vast amount of information gleaned from deployed systems to enhance and implement higher levels of autonomy. Mobileye L0-L2 ADAS: Mobileye is a global leader in the development of computer vision technology for ADAS. Enabled by Mobileye’s system-on-chip (SoC) product called EyeQ®, Mobileye technology powers L0, L1 and L2 reactive safety features such as forward-collision warning, automatic emergency braking and lane-keeping assist in millions of vehicles around the world across 25 automakers. About L2+: Introduced by Mobileye, the L2+ category advances L1-L2 driver assistance safety features to provide more convenience to drivers on the road today. L2+ enhances a vehicle’s semi-autonomous capabilities by leveraging Mobileye’s Road Experience Management™ (REM™) mapping solution, using Roadbook™ data to enable the use of adaptive cruise control, lane-keeping assist and other advanced maneuvers in more complex driving scenarios, such as urban environments. Though drivers of vehicles equipped with L2+ technology are required to remain alert in order to affirm actions and take over as needed, the enhanced features provide significant convenience and safety benefits while bridging the gap to higher levels of autonomy. 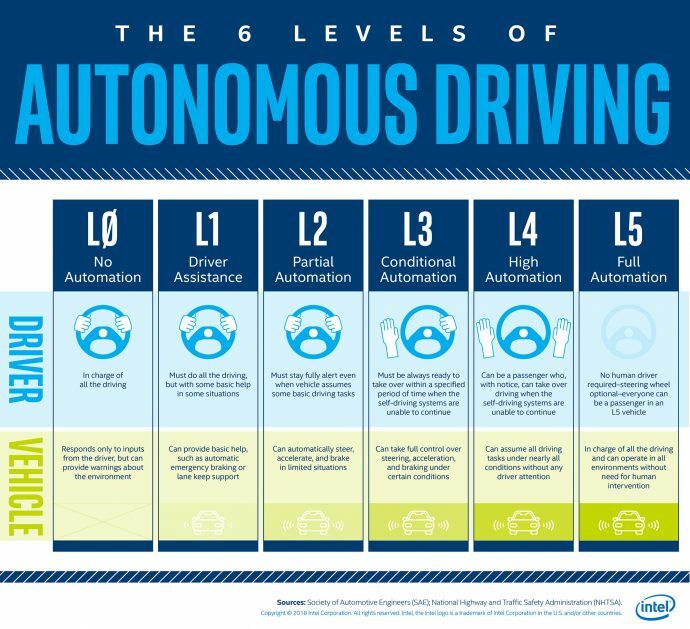 Level 3 and Full Autonomy: In tandem with ADAS and L2+ integration, Mobileye is supporting automakers with the development of higher levels of autonomy, including L3 for passenger vehicles and L4 and L5 to support fleet-owned networks for fully autonomous vehicles. Mobileye’s engagement with GWM adds to its existing collaborations for L3 systems with leading automakers including BMW*, Fiat-Chrysler*, NIO*, Nissan* and SAIC*, as well as its strategic partnerships for L4/L5 development with BMW, Delphi* (now Aptiv*), Fiat-Chrysler*, NIO*, SAIC, and Volkswagen* for Mobility-as-a-Service in Israel.